When it comes to furry friends, Lapland isn’t all about reindeer! I know, hard to believe isn’t it?! And there are some fauna foes out there too… I’ve been hanging out with lots of crazy creatures so I can bring you my top 5 animals of Lapland! These pesky individuals eat ANYTHING. Such greedy gluttons! 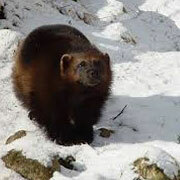 The wolverine looks like a cross between a bear and wolf, though I’m reliably informed they’re more closely related to otters and badgers. Definitely not as friendly as otters and badgers though! They won’t cause you any bother, but if I had a carrot for every time a wolverine’s stolen my carrot…I’d have all my carrots back! 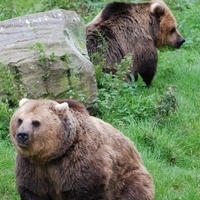 The brown bear is the most common of the big omnivores in Lapland (also found in these parts are wolves, lynx and the aforementioned wally wolverine). They are also the fuzziest. Bears can be scary, but don’t worry – like the wolverine, they’re not dangerous to humans and are more afraid of you than you are of them! It’s me who has to watch out! Fortunately, I haven’t seen one for a while – unless you count the teddy bears being made in Santa’s workshop – they are WAY nicer. My feathered friends the eagles are elusive to say the least! 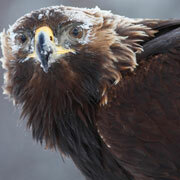 If you spot an eagle in Lapland…or anywhere for that matter, you should get a prize. However, I did manage to track one wise guy down recently and he gave me some interesting facts to share. Eagles are different from most other birds of prey by their larger size, more powerful build, and heavier head and beak. As the phrase ‘eagle-eyed’ suggests, eagles have incredible eye site and while humans see just three basic colours, eagles see five! This enables them to spot even well-camouflaged potential prey from a very long distance – I’m impressed! Eagles are admired the world over as living symbols of power, freedom, and transcendence – that’s all very well, but it’s a lot better being symbol of Christmas, right?! Coming in at number 2, are our faithful friends, the Huskies! Though often kept as pets today, Huskies have been used to pull sleds in northern regions of the world for hundreds of years – the perfect transport for your ‘Search for Santa’ day in Lapland then! You can also book the Husky Heaven adventure for your visit with us, for more husky hilarity. Huskies are energetic and athletic, and usually have a thick double coat that can be gray, black, copper red, or white. Huskies are known for their pale blue eyes, although they may also have brown eyes, green eyes, blue eyes, or even different coloured eyes! Santa’s favourite husky is the adventurous Hannes who is in charge of all the fantastic excursions we have in Saariselkä. He’s bold as brass but very friendly! I get on with him pretty well, but he’s soooo noisy and always running off. If you’re reading this, Hannes – chill out! And at number 1, and officially the best animal of all time forever and always, is ME! Well, all reindeer of course. We are fun, friendly, hard-working, creatures who love to meet new friends – a lot of us are pretty handsome too. A big shout out to Dasher, Dancer, the rest of the sleigh gang – boy, do we have the greatest job! Most of our species migrate to the coast in Spring, but we stay close to Santa throughout the year training for our big night on Christmas Eve when we get to help deliver presents to children all over the world – it’s our favourite night of year and we always have fabulous time. You’ll definitely meet some of us on your visit, but why not book my Reindeer Run – an extra-special, magical experience. You’ll love it! 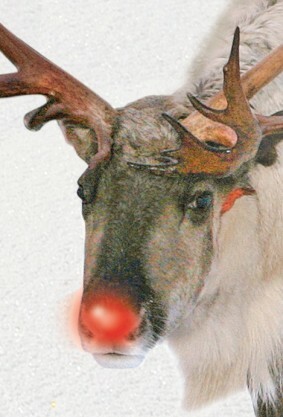 I hope you’ve enjoyed learning about the animals of Lapland! What’s your favourite animal?